Have roots on bottom of potato and vines out the top. 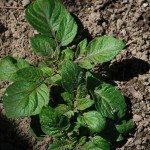 Do I plant the whole potato or only take cuttings from the top? It is a big potato but am afraid it may rot if I now put the whole bottom into ground. HELP, PLEASE! You can do either, plant whole or cut into pieces.